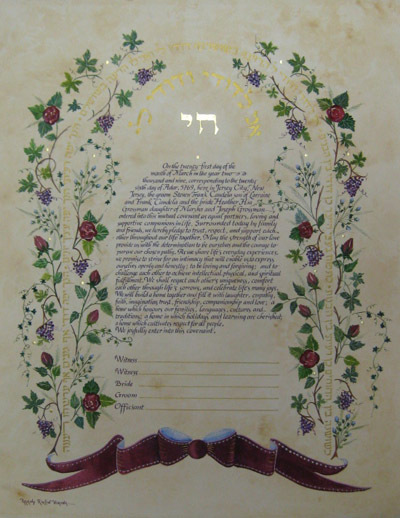 The personalized Ketubah includes the CHAI motif in raised Gold Leaf (optional). The purple Interfaith text is imitating the Gate motif. The Gate motif, which symbolizes the beginning of a life together, is constructed with verses from the "Song of Songs" and illuminated with roses and grape vines. The gently curving burgundy ribbon emphasizes togetherness and unity.